I pull into the parking garage and am ready to switch modes. I reach into my hand bag to pull out my new daily accessory. It is not something I would ever look for in the mall or on line. It is a simple metal chain; similar to the ones soldiers hang their dog tags on only more delicate. Dangling from the bottom is a yellow plastic ID card that allows me access to the locked wings of the 8th floor. Earlier in the day I was a mom playing happily with her 21 month old toddler. Now, as I pull my new necklace on in the parking lot of Children's Hospital Boston I become something different. My five day old son lies in the cardiology Intensive Care Unit, 8 South. I have joined a club no parent wants to be in and my new chain necklace is my admission ticket. In reality, I have a child with medical needs so great he required intensive intervention from the moment he was born. Despite this reality I am one of the lucky ones. I sit alone with him in his room now and watch him sleep. Generally I prefer to hold him while I am here, but he fell asleep after feeding so I took a few moments to eat something and run to the bathroom both of which require a trip outside the unit. There is no eating in the rooms, no cell phone use either. Moments with my son are precious but I must remind myself I only just had him 5 days ago and he needs me to be strong so I must take care of his mommy too. He looks so peaceful I am afraid I’ll wake him if I lift him from his bed. I did not worry about this transition with my first son. I was free to lift and snuggle at will. The additional complications in lifting due to the multiple wires and tubes laced across the bed too large for his little body not so gently attached to him with tape make what should be a simple task infinitely more complicated. At least the ventilator tubes are gone. Their presence allowed for no holding. Despite these barriers, I am one of the lucky ones. There are monitors in the room telling me what those wires are reading. Green for pulse rate, blue for oxygen levels on the way in, yellow for the way out. There is a white number, but I do not know what it is reading nor does it seem to be relevant. Why then I wonder do we need to look at it? When an alarm sounds from the monitors there is no frantic response from staff. They come in and generally hit a rest button and check to make sure the wires and such are properly attached. Often they have slipped off his soft newborn skin. There is the small medication box containing the Alprostadil, the medication greatly responsible for his being alive today. We have stopped the medication twice already, and stared it again for the third time today. I know there will be another round of off and possibly back on the medication. His heart condition obstructed blood flow to his lungs. The medication provides for a back door to that flow allowing for his blood to be oxygenated and therefor for him to live. I hate and love the box equally. Its presence reminds me that the procedure performed on his heart when less than a day old has not fully remedied the problem yet. He still cannot get enough blood to flow through the right side of his heart to feed the needs of his body and brain. The medication is still needed to keep him alive. He is on just this one medication. As I walk through the wing each day I see other children with up to 12 or 15 medicine boxes. Despite its presence, I am one of the lucky ones. I have seen several children transfer in, many from other states. I hear parents swapping stories in the family room about the progress their child is or is not making. Often they talk about how far they have come to be at Children's, a four hour drive, a seven hour drive, a plane ride. I am able to sleep in my own bed every night. I am able to see my older child daily, even if for a short while and try to maintain some order in his life. I am able to briefly distract myself by doing some "every day" things like laundry and cleaning therefor not feeling like the hospital is the only definition of our lives. It is a mask for sure, but it does help. I am running my schedule around shifts at the hospital. I am able to nurse him when I am there, and pump at home for the times I am not. We have been able to avoid a feeding tube which is the exception for most of these children. I can easily bring in what I provide for him. My drive is short in comparison, 30 minutes typically. I don't mind even if there is a little traffic. My distance is nothing; I am one of the lucky ones. I was able to tour the unit a few months ago. An advantage to knowing the condition existed well before his birth. Being quite pregnant at the time the exposure to the unit was more than a little emotionally overwhelming. It was equally overwhelming, but in a very different way coming in just after his birth. The shock has, after a few days lessoned and the reality of the floor set in. There are more than infants on the floor. There are children of many ages, but most are quite young. They all share one thread; there is a problem with their heart. For my son this one glitch is his only issue. For most however, this is not the case. They are confronted with multiple obstacles to overcome. Daily I hear the cries of pain from the young, the looks of anguish on the faces of the parents of the newly admitted, and the look of pretend acceptance on those whose child has been there way too long. I don’t think you can ever fully accept this is the reality for your child. There is Steven* with his cute chubby cheeks, who I remember from my visit before Christmas, Angela who, at about 2 years of age is celebrating her 1st anniversary of her heart transplant, and Levi who born the same day as my son, endured two heart surgeries while in utero and will likely be facing more. Walking through 8 South is the most humbling and sobering experience of my life. Despite my son’s needs, I am one of the lucky ones. The medication was maintained for another day and a half. We decided to give his small body a chance to rest and to essentially relax before trying to terminate the medication again. It seems to have worked as good news finds us today. He has been off the medication now for almost two days and is basically holding his own. He was, this morning, moved out of the confines of 8 South to the step down unit of 8 East. He continues in a wing that specializes in cardiology patients. 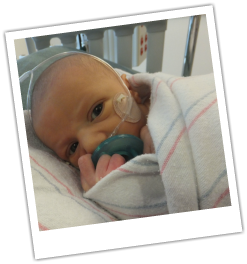 He has fewer monitors, but continues to be watched for the blue number and continues to be supported with enriched oxygen through a tube in his tiny nose. He pulls at the tube often, I cannot blame him. It looks uncomfortable. It’s set on 2, soon they will lower it to 1, and then to nothing. He needs to maintain adequate oxygen levels without the support of the oxygen tube before he will be released. Luckily he has already proven to be a good eater eliminating one obstacle from his discharge. We can eat in this room and there is a bathroom right there. We are able to have more visitors. We might even get to walk around with him during the day. I would like to get him near the window to bath in some sun light. Perhaps this will erase the last traces of yellow from his skin. I am excited to return to the unit today. I realize there may still be setbacks, but in general his trajectory is clear. For my son, it is not a question of if he comes home, only when. I know that is not the reality for all of the other children in 8 South. My heart aches for them and their families; I am truly one of the lucky ones.